Gretna originates from Gaelic Greatan and is a beautiful town located in the Dumfries and Galloway in culture-rich Scotland. In a smaller sense, what Las Vegas is for Americans, Gretna is for Scots, but not in terms of casinos and the gambling industry, but when it comes to snap a marriage certificate quickly. Gretna is known for tying the knot in a simple way. Thanks to its geographic location, being nearby the Anglo-Scottish border, somewhere around Gretna Green, it falls under a more liberal administration district where the Scots Law supports liberal marriages. When we go back in history to the early 17th century, prior to the Union of England and Scotland in 1707, Gretna served as a customs point where customs were collected on the border between England and Scotland. It was connected to Annan by a road that was known for cattle transportation to the Kingdom of England. After 1707, the English Parliament passed the Marriage Act in 1753. The Law stipulated that no marriage could be solemnized without the parents’ consent if both future spouses were under 21., but this only applied to those in England and Scotland still operated under the old law where boys could marry when they turn 14 and girls 12. Many Englanders, to avoid the ruling hand in England, found it convenient to come to Scotland just to get the married. 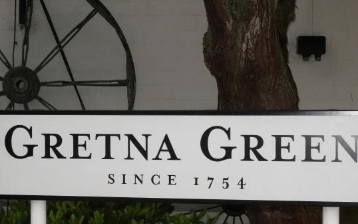 Since Gretna was usually their first destination after they crossed the border, they would seal the deal there. During WWI Gretna was known for the HM Factory that manufactured ammunition for the British Army. 14 km long, the factory was the biggest ammunition production center that employed 30,000 workers, mostly women since the men were mostly fighting in the military. During that time, another Gretna event will make the public and the government point their fingers on them. Namely, the factory workers, who have usually housed nearby the factory in Carlisle, and when they would return home from work they would gather in pubs and become known for their excessive drinking. As a response to such behavior, the Government drafted the State Management Scheme which prohibited drunkenness and monitored the spirit and beer use in pubs. The government controlled the pubs and all liquor stores and industries. After WWI, the factory was dissolved, but the law remained intact for a very long time, preaching doctrines of alcohol abstinence. The marriage trend by which the town is known is still keeping the town a vivid and exciting Scottish side. Gretna is still Scotland’s hotspot for marriage, and the marriage industry is one of the main drivers of the local economy. According to statistics, every 6th couple in Scotland comes to Gretna to get married, and sometimes, Gretna Green. People get usually married at the Registrar’s office, Anvil Hall, or in reception halls of hotels. Besides its marriage sites, Gretna is also home to the Gretna Gateway Outlet Village which are roughly speaking discount factory shops. Besides the beautiful natural scenery of Gretna, flocks of colorful starlings can also be spotted from time to time which contributes to the town’s landscape. Precisely Gretna provides shelter to them who flee from the harsh Scandinavian and Russian winters. The town had drawn the attention of the public when the Gretna F.C. football club was promoted to the Scottish Premier League in the season of 2007/2008. It was a huge success for Gretna as a town, but the club did not last and was dissolved in the same year due to lack of financial support for the club. Gretna F.C. was relegated from the SPFL First Division to Third Division which was very frustrating for the aspiring team and the town. Still, hope was restored after Greta F.C. 2008; a newly formed FC club was founded to the delight of many Gretna football fans. The club is nowadays doing well, playing in the Lowland League, but it has the potential to upgrade to the SPFL in the following years. Besides football, which is the number 1 for Gretna inhabitants, rugby is also very popular and widely watched. Gretna is a charming small town that has a lot to offer not only to natives but also to tourists.